The U.S. 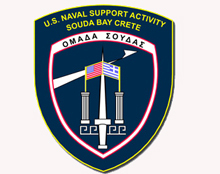 Naval Support Activity (NSA) Souda Bay is located on Crete, Greece on the Hellenic (Greek) Air Force Base near the village of Mouzouras, approximately 10 miles east of the city of Hania. NSA occupies an area of approximately 110 acres on the north side of the air base, which is home of the Hellenic Air Force's 115th Combat Wing flying F-16 aircraft. They are physically located on the large, circular shaped Akrotiri Peninsula, which forms the northern face of the Souda Harbor.